Please join the Harvard Club of the UK at the National Portrait Gallery for a private talk on the exhibition Cézanne Portraits. The exhibition ends February 11th, so catch the show before it closes! Arrival: Enter via the main entrance (or the shop entrance for step-free access), both located on St Martin’s Place. Paul Cézanne (1839-1906) is one of the most influential artists of the nineteenth century and his unique method of building form with colour and analytical approach to nature influenced the art of Cubists, Fauvists, and successive generations of avant-garde artists. Over a working life of some forty-five years, Cézanne made almost 1,000 paintings of which around 160 are portraits. The exhibition will offer a unique and fascinating insight into this central aspect of his work, highlighting the special pictorial and thematic characteristics of his portraiture including his creation of complementary pairs and different versions of the same subject. The exhibition will also consider the extent to which particular sitters shaped the development of his practise. 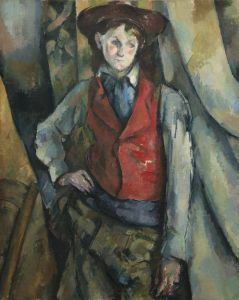 Paintings on display will range from multiple portraits of himself and his wife, Hortense Fiquet, Cézanne’s remarkable portrayals of his Uncle Dominique, dating from the 1860s, through to his final portraits of the gardener Vallier, who helped in his studio at Les Lauves, Aix-en-Provence. Cézanne Portraits is curated by John Elderfield, Chief Curator Emeritus of Painting and Sculpture at The Museum of Modern Art, New York, with Mary Morton, Curator and Head of Department, French Paintings, National Gallery of Art and Xavier Rey, Director of Collections, Musée d’Orsay.